In our Bowl, we are not content with just the store-bought trading cards. Yugioh and Pokemon are alright, but imagination trumps all. In addition to the fun of magic markers, the computer helps us too. The H2Y found Yugioh Card Maker where you can input any photo and label them whatever you want -- all on a Yugioh Card background. Pretty swell we smell. 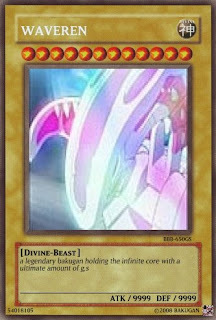 H2Y made this one of a Bakugan. We find that if you print the page at 72% and print it on card stock, you have some excellent fakes!